would not work. 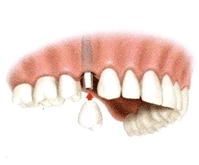 Mini implants can be used to replace a single tooth and are very effective for stabilizing lower dentures. Overdentures and horseshoe dentures can also be snapped over these mini implants, making your appliance strong enough to eat corn on the cob. Mini implants are FDA approved. SIMPL implants use cad cam technology to design individual abutments for each patient. Instead of using a stock replacement, Dr Sarett takes an impression of the tooth to be replaced. The replacement change is then made-to-order insuring good fit, a strong replacement, and a good look. are very effective and less costly.